Lenovo S820, Restore Lenovo Standard Recovery File – A lot reader on my blog asking me, after installing custom recovery how do i can back to Lenovo Recovery ? Usually i ask them to make ROM backup first before performing any ROM modification, but sometime they feel difficult how to backup the current running ROM so because of this i will show how to restore Lenovo standard recovery to Lenovo S820 running S221 ROW version firmware. This guide is using ROW_S221 recovery file, i don’t know if it can be use for firmware beside ROW_S221 but if you try, please give me the result so everybody can knows that this can be use for another ROW firmware version. This guide has possibility to brick your device so please follow this guide with careful. Your device must be using ROW version firmware, this file different with china version recovery file so please don’t attempt to do on china version firmware. SP Flash Tool v3.1320 ↦ flash tool to install recovery file to your device, very suggestion to use this version, or you can use MobileUncle to install recovery file to your device. Download all files required on your computer, before continued to next step please make sure that USB VCOM driver is completely installed on your device so flash tool can recognize your device once it connected. Extract ROW_S221_recovery and Flash Tool on one folder for easy organize it, go to flash tool extracted folder and run flasht_tool.exe, remember to run it with administrator privilege if you are using windows 7 or later. 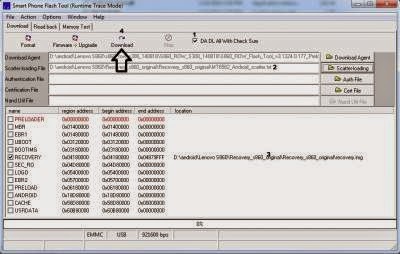 On the flash tool check DA DL All with Checksum option, this is important don’t forget or you will get error after flashing. Now click on Scatter-Loading button and point it to ROW_S221_recovery extracted folder and select MT6589_Android_scatter_emmc.txt, this will automatically load recovery image to flash tool. Now you can press Download button or hit F9, warning information will show that tell you not all images successful loaded, just click Yes button. Flash tool will become stand by and ready to make connection with your device. Now turn off your device and remove the battery, when ready connect your device to your computer using USB cable. 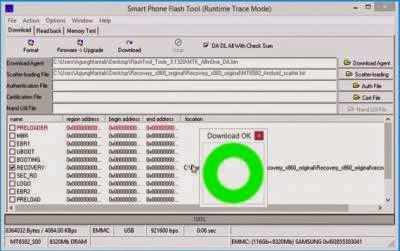 Flash Tool will recognize your device and begin to start flashing process, this flashing just take 5-10 second to finish. When you see GREEN CIRCLE on the middle of flash tool that mean flashing is finish. Done, now you can disconnect your device. Please confirm that Lenovo Standard Recovery already installed on your device. go to recovery press and hold Power button + Volume Up + Volume Down button until you can see language option. hi! i have a problem on installing the vscocam. im using vibe 2.0. i can download it but i cant install it. do you have any idea what is the problem? Is there an alternative to flash a new rom without Lenovo's China Recovery? follow this guide http://bit.ly/1wPlj9V, it will restore your phone to international or ROW firmware with english Lenovo Recovery and follow this guide http://bit.ly/1AzIxQe if you wanna change your recovery to TWRP or custom recvoer. After doing 1st link, will root access be lost??? Is root access needed for flashing VIBE UI ? rooted not needed when flashing using flash tool, 1st link if re flashing your device using ROW 221, root can be obtain on the 2nd link.